2.25 pm ISTGreenply shares down 7% as profit falls in Q1Greenply Industries Ltd shares fell as much as 7.16% to Rs 205.45 after the company reported a net profit of Rs 23.82 crore in the quarter ended 30 June, compared to a profit of Rs 30.63 crore a year ago. Revenue from operations during the quarter came in at Rs 405 crore, down from Rs 422 crore in the same period last year. 2.15 pm ISTLupin shares fall 2% as profit declined in June quarterLupin Ltd shares fell as much as 2.30% to Rs 845.10 after the company posted a 43% fall in first-quarter profit, widely missing analysts’ estimates. Net profit was Rs 203 crore in the quarter ended 30 June, compared with a profit of Rs 358 crore a year earlier, Lupin said. Analysts on average had expected a profit of 3.51 billion rupees, according to Thomson Reuters I/B/E/S. Total revenue from operations declined marginally to Rs 3,856 crore. 12.45 pm ISTSensex, Nifty surge to record highsBSE Sensex traded higher by 218.16 points, or 0.58%, to 37,883.96, while the Nifty 50 rose 53 points, or 0.47%, to 11,442.45. In intraday trade, Sensex surged 219.97 points to a new high of 37,885.77 and the Nifty 50 advanced 59.9 points to a fresh record high of 11,449.35.BSE MidCap and SmallCap edged up 0.17% and 0.53%, respectively. Among the sectoral indices on BSE, consumer durables, energy, industrials, bankex and finance led gains. IT, tech, power and utilities declined.ONGC, Reliance Industries, Tata Motors and Lupin were among the top gainers, whereas HPCL, Maruti, Bharti Airtel and Infosys were among the major losers. 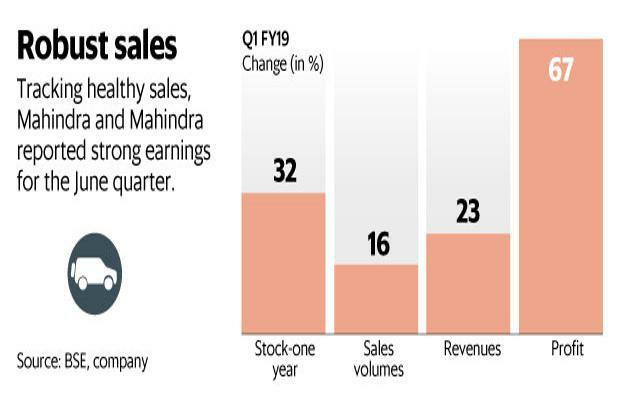 12.20 pm ISTDai Ichi Karkaria shares plunge 10% after Q1 lossDai Ichi Karkaria Ltd shares dived 10.17% to Rs 330 after the company reported a net loss of Rs 1.24 crore in the June quarter, compared to a profit of Rs 2.05 crore a year ago. Revenue from operations stood at Rs 28.35 crore in the quarter ended 30 June, compared to Rs 31.85 crore in the same period last year. 11.45 am ISTPNB Housing Finance shares fall ahead of Q1 resultsPNB Housing Finance Ltd traded 0.95% lower ahead of June-quarter earnings today. Moreover, parent Punjab National Bank said that it expects to complete the stake sale in PNB Housing Finance by the end of the financial year. 11.20 am ISTBombay Dyeing shares down 5% as loss widensBombay Dyeing and Mfg Co. Ltd shares fell as much as 4.9% at Rs 248.45, its lowest since 30 July. The company’s June-quarter loss after tax widened to Rs 93.74 crore from Rs 32.71 crore last year. Revenue from operations fell 36.2% to Rs 397 crore in the quarter. 10.30 am ISTPNB shares trade little changedPunjab National Bank shares traded 0.24% higher at Rs 83.05. The PNB stock hit a high of Rs 83.80 and a low of Rs 81.60 during the day. The bank, which reported a $2-billion fraud in February, on Tuesday declared a June quarter loss of ₹940 crore, against a profit of ₹343 crore a year ago. 9.57 am ISTGOCL Corp shares turn flat after rising 4%GOCL Corporation Ltd rose 4% to Rs 400 in early trade, but gave all the gains. The company said it got explosives order worth Rs 203.09 crore from Singareni Collieries. 9.40 am ISTAdani Enterprises shares fall 5% after Q1 profit declinesAdani Enterprises Ltd fell 5% to Rs 180 after the company reported 43% fall in June quarter net profit to Rs 80.14 crore from Rs 141.15 crore a year ago. 9.25 am ISTInox Wind shares jump 9% as Q1 turns profitableInox Wind Ltd rose 9% to Rs 107.40 after the company said it reported a profit of Rs 10 crore in June quarter against a loss of Rs 39 crore last year same quarter. 9.18 am ISTSensex, Nifty open higherBSE Sensex traded higher by 72.29 points, or 0.19%, to 37,738.09, while the Nifty 50 rose 23.05 points, or 0.20%, to 11,412.50. 9.13 am ISTRupee trades marginally higher against US dollarThe Indian rupee was trading marginally higher against the US dollar, tracking gains in local equity markets. At 9.12am, the rupee was trading at 68.64 a dollar, up 0.05% from its previous close of 68.69. The currency opened at 68.66 a dollar.Bond yields gained for the fifth consecutive session after crude oil prices rose. Crude prices which were trading up at $ 74/bbl and advanced further during the day threatening to breach the $75/bbl mark. The 10-year bond yield stood at 7.791%, from its Tuesday’s close of 7.786%. Bond yields and prices move in opposite directions.So far this year, the rupee has weakened 7%, while foreign investors have sold $410.30 million and $5.62 billion in equity and debt markets, respectively.